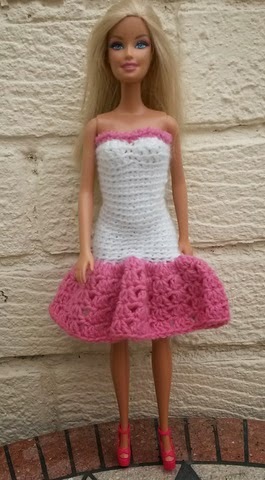 Its been a while since I made anything for Barbie so I had a look in my stash and found some oddments of 4ply yarn. 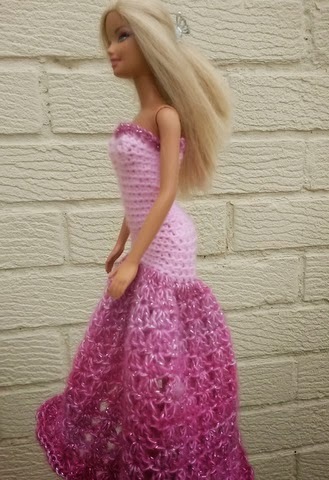 I had forgotten I had the sparkly pink yarn so what else to make but a prom dress. The metallic colour yarn is Sirdar Firefly which I bought ages ago as it was on offer, with the idea that it might come in useful for a scarf but it makes an interesting skirt for the dress. 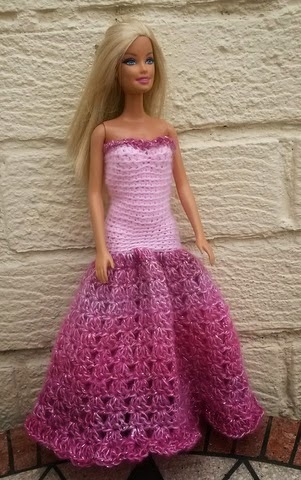 The dresses are made from the top down so are easy to put on Barbie. The only problem is you have to be very careful as her feet can get caught in the crochet. I usually hold her feet as I pull the dress on. The bodice is shaped at the rear (as photo) so the skirt is lower at the back - I was shopping with my daughter and granddaughter looking at prom dresses a few weeks ago and noticed that lots of them have this type of shaping. The dress is very tight fitting so be careful with tension- but as these little garments are so quick to make it takes no time pull work out and start again! If you find any mistakes are have problems with the pattern please leave me a comment. Note: These designs are worked in a continuous round so place a marker at beg of round to keep track of number of rounds. The dress is made from the top down. Edge round: work 5tr in each cluster around. using no 3 hook and contrast work a round of (dc, 1ch) in each chain, around neck line. To Finish: sew in all yarn ends.